Sowmya Multi Speciality Dental Clinic offers Sedation Dentistry services for non cooprative children. Paediatric Dentists recommend sedation for long, complex procedures and for patients who are especially young or nervous. Sedating a patient is normally a very safe procedure, and parents can help reduce the risks and stress level of their child, before, during and after treatment. Oral sedation is most commonly used technique to clam down the child, relax and cooperate during treatment. It is taken by mouth or through nose as soon as patient arrives at the clinic. Usually it takes 20 mins to take effect. The advantage of oral sedation is that it does not put the child into sleep, but keeps the child clam, relaxed and cooprative. Nitrous oxide commonly known as laughing gas can keep children remain clam. A mask delivers oxygen and nitrousoxide and within 5 minutes the patient becomes clam and relaxed. At the end of process pure oxygen is given to clear any remaining nitrous oxide. Intravenous sedation is delivered through a needle inserted into the patient’s vein. Nitrous oxide is used to send the child to sleep before a needle is inserted, usually into a vein on the back of the child’s hand. A tube is also inserted into the patient’s throat to aid breathing. This is the last approach used and for long treatment procedures. Sedation is safe as long as proper precautions are taken pre sedation and post sedation. Your dentist will give you complete instructions when your child needs to undergo sedation dentistry. 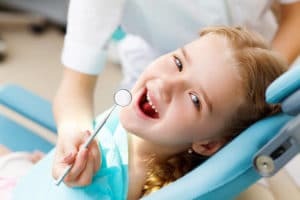 At sowmya dental clinic, our paediatric dentists are specialised in different sedation dentistry techniques to help treat the non cooperative children. We are one among the few paediatric dental clinics in Guntur, to offer sedation dentistry.